The Luxe Comfort Footrest from AI Data is an angle adjustable footrest - adjustment is made with a moderate application of pressure by the feet. 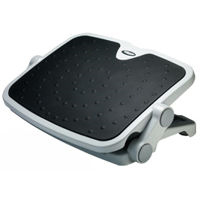 The Luxe Comfort Footrest has a large rubber non-skid platform. The angle is adjustable and the height adjusts from a 'stored' flat position to a raised position which locks into place. The footrest is made of a durable high impact ABS plastic. We have access to many products.If the product that you are looking for is not listed, e-mail brian@ergovancouver.net and we will do our best to find it. Diagrams and cartoons are copyright Melanie Stride.